Antarctica, the most remote and inaccessible continent, is no longer the most unknown. All its mountain regions have been mapped and visited by geologists, geophysicists, glaciologists, and biologists. Mapping data can now be obtained by satellite rather than by the theodolites of surveyors. Many hidden ranges and peaks are known from geophysical soundings of the Antarctic ice sheets. By using radio-echo sounding instruments, systematic aerial surveys of the ice-buried terrains can be made; some of these are almost as well mapped as the exposed ones. The ice-choked and stormy seas around Antarctica long hindered exploration by wooden-hulled ships. No lands break the relentless force of the prevailing west winds as they race clockwise around the continent, dragging westerly ocean currents along beneath. The southernmost parts of the Atlantic, Pacific, and Indian oceans converge into a cold, oceanic water mass with singularly unique biologic and physical characteristics. Early penetration of this Antarctic (or Southern) Ocean, as it has been called, in the search for fur seals led in 1820 to the discovery of the continent. Icebreakers and aircraft now make access relatively easy, although still not without hazard in stormy conditions. Many tourists have visited Antarctica, and it seems likely that, at least in the short run, scenic resources have greater potential for economic development than do mineral and biological resources. 1. Antarctica is actually a desert, receiving about the same precipitation (less than 2 inches a year), as the Sahara Desert. 2. If Antarctica were to melt, the sea level would rise over 200 feet. 3. The Land of the Midnight Sun exists in the south, too: during the summer, the interior of Antarctica enjoys almost continuous daylight. 4. 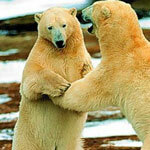 The polar bear cannot be found anywhere in the Antarctic region. It only lives in polar regions of the Northern Hemisphere. This includes Russia, Norway, Greenland, Canada and Alaska. 5. Antarctica is the 5th largest of the world's 7 continents but was not sighted until 1820. No economic activity is conducted at present, except for fishing off the coast and small-scale tourism. Climate: Severe low temperatures vary with latitude, elevation and distance from the ocean. East Antarctica is colder than West Antarctica because of its higher elevation. The Antarctic Peninsula has the most moderate climate. Higher temperatures occur in January along the coast and average slightly below freezing. Natural hazards: Katabatic (gravity-driven) winds blow coastward from the high interior. Frequent blizzards form near the foot of the plateau. Cyclonic storms form over the ocean and move clockwise along the coast. Active volcanoes exist, but other seismic activity is rare and weak. Geographic note: Antarctica holds several records as the highest, driest, coldest and windiest on earth. The continent is mostly uninhabitable. It has no native population- its residents are scientific and support staffs who usually stay no more than a year at a time. No land-based vertebrate animals inhabit Antarctica. Invertebrates, especially mites and ticks, which can tolerate the lower temperatures, exist in the Antarctic Peninsula but are still considered rare. The surrounding ocean, however, abounds in living creatures. Large numbers of whales feed on the rich marine life. 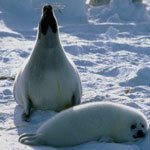 Six species of seals and about 12 species of birds live and breed in the Antarctic. 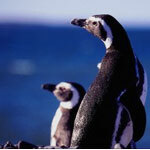 The most prominent inhabitant of the Antarctic is the penguin. It lives on the packed ice and in the oceans around Antarctica and breeds on the land or ice surfaces along the coast. (Dec. 1, 1959), agreement signed by 12 nations, in which the Antarctic continent was made a demilitarized zone to be preserved for scientific research. The treaty resulted from a conference in Washington, D.C., attended by representatives of Argentina, Australia, Belgium, Britain, Chile, France, Japan, New Zealand, Norway, South Africa, the United States, and the Soviet Union. Later other nations acceded to the treaty. The treaty did not deny or support national claims to territorial sovereignty in Antarctica, but it did forbid all contracting parties from establishing military bases, carrying on military maneuvers, testing any weapons (including nuclear weapons), or disposing of radioactive wastes in the area. The treaty encouraged the freedom of scientific investigation and the exchange of scientific information and personnel in Antarctica. The treaty bound its members indefinitely, with a review of its provisions possible after 30 years. A protocol to the 1959 treaty was signed in 1991. The agreement banned mineral and oil exploration for 50 years and included regulations for the protection of the Antarctic environment. Antarctica is the only continent with no nations. While seven nations (not including the United States) have made claims to Antarctica, no single nation controls any part of the continent. The Antarctic Treaty governs the actions of people in Antarctica.